Were Hedge Funds Right About NXP Semiconductors NV (NXPI)? Is NXP Semiconductors NV (NASDAQ:NXPI) a good bet right now? We like to analyze hedge fund sentiment before doing days of in-depth research. We do so because hedge funds and other elite investors have numerous Ivy League graduates, expert network advisers, and supply chain tipsters working or consulting for them. There is not a shortage of news stories covering failed hedge fund investments and it is a fact that hedge funds’ picks don’t beat the market 100% of the time, but their consensus picks have historically done very well and have outperformed the market after adjusting for risk. NXP Semiconductors NV (NASDAQ:NXPI) was in 72 hedge funds’ portfolios at the end of December. NXPI has experienced a decrease in activity from the world’s largest hedge funds lately. There were 78 hedge funds in our database with NXPI positions at the end of the previous quarter. The decline in hedge fund interest is probably due to merger arbitrage funds that are getting out of this trade. Oveall, our calculations showed that NXPI is still among the 30 most popular stocks among hedge funds, ranking 28th. In the 21st century investor’s toolkit there are plenty of tools shareholders use to grade publicly traded companies. A pair of the most underrated tools are hedge fund and insider trading signals. We have shown that, historically, those who follow the best picks of the elite fund managers can outpace the S&P 500 by a healthy amount (see the details here). We’re going to take a look at the recent hedge fund action encompassing NXP Semiconductors NV (NASDAQ:NXPI). How are hedge funds trading NXP Semiconductors NV (NASDAQ:NXPI)? Heading into the first quarter of 2019, a total of 72 of the hedge funds tracked by Insider Monkey were long this stock, a change of -8% from the second quarter of 2018. 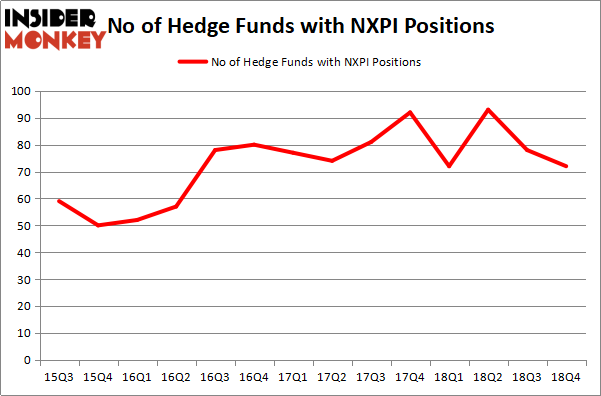 On the other hand, there were a total of 72 hedge funds with a bullish position in NXPI a year ago. With hedge funds’ sentiment swirling, there exists a select group of key hedge fund managers who were adding to their holdings considerably (or already accumulated large positions). Among these funds, Pentwater Capital Management held the most valuable stake in NXP Semiconductors NV (NASDAQ:NXPI), which was worth $771.6 million at the end of the third quarter. On the second spot was D E Shaw which amassed $530 million worth of shares. Moreover, Soroban Capital Partners, HBK Investments, and Millennium Management were also bullish on NXP Semiconductors NV (NASDAQ:NXPI), allocating a large percentage of their portfolios to this stock. Due to the fact that NXP Semiconductors NV (NASDAQ:NXPI) has experienced bearish sentiment from the entirety of the hedge funds we track, it’s safe to say that there was a specific group of hedge funds that decided to sell off their entire stakes by the end of the third quarter. 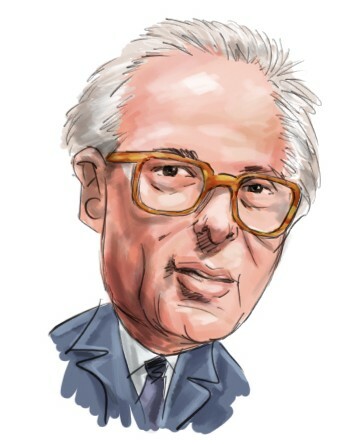 It’s worth mentioning that Paul Singer’s Elliott Management dropped the biggest position of the “upper crust” of funds followed by Insider Monkey, comprising close to $897.8 million in stock, and David Costen Haley’s HBK Investments was right behind this move, as the fund sold off about $427.5 million worth. These moves are important to note, as total hedge fund interest fell by 6 funds by the end of the third quarter. Let’s go over hedge fund activity in other stocks – not necessarily in the same industry as NXP Semiconductors NV (NASDAQ:NXPI) but similarly valued. We will take a look at Tencent Music Entertainment Group (NYSE:TME), McKesson Corporation (NYSE:MCK), Xilinx, Inc. (NASDAQ:XLNX), and CRH PLC (NYSE:CRH). This group of stocks’ market caps are similar to NXPI’s market cap. As you can see these stocks had an average of 31.25 hedge funds with bullish positions and the average amount invested in these stocks was $870 million. That figure was $3502 million in NXPI’s case. Xilinx, Inc. (NASDAQ:XLNX) is the most popular stock in this table. On the other hand CRH PLC (NYSE:CRH) is the least popular one with only 8 bullish hedge fund positions. Compared to these stocks NXP Semiconductors NV (NASDAQ:NXPI) is more popular among hedge funds. Our calculations showed that top 15 most popular stocks among hedge funds returned 19.7% through March 15th and outperformed the S&P 500 ETF (SPY) by 6.6 percentage points. Hedge funds were also right about betting on NXPI as the stock returned 27.8% and outperformed the market as well.